After the Scottsdale show Richard Edmunds, Halina Billing, Lloyd Tunbridge, Harry Nolan and John Booth moved on to Woolmers for the Festival Of The Roses. We were joined there by Lutz Bockisch, Fred Harris, Kaye & Brian Ling, Judy & David Burk and Lyn Richards. Great weather terrific location and company wasn’t bad either. Brian Cooper shearing plant and bullock yokes, Richard his scale Sunbeam Tiger, Series 1 Landrover, and a Fowler crawler. John some old chainsaws , Lutz Minature Hit and Miss engines. Harry chainsaw collection, David Moffett Virtue and a Mcdonald Diesel and Lloyd two Internationals and a Lister . It topped off a great three days of shows thanks all. A wet start to the day but it turned out very hot. We had a good display and lots of interest from the public. Viv Voss – 1923 Fairbanks Morse 1 ½ hp , 1930 International type M 1 ½ hp. Friday the 16th of November Halina Billing , Richard Edmunds, Eddie Jongschaap, Harry Nolan, Ian Clayton Lloyd Tunbridge and myself, John Booth, left our homes in the early hours to head to the Scottsdale Show. 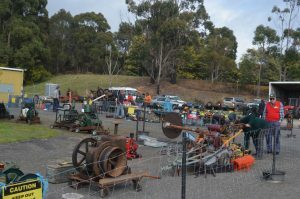 The weather was nice for the two day show, on show was Ian Clayton’s assorted tools, Drills, pumps and a 1 hp aircooled Cooper. Richard Edmunds and Halina Billing had Richard’s Sunbeam Tiger 5/8 scale, Landrover series 1 5/8 scale, 1946 Fowler Crawler ½ scale and a crankless 985cc 5/8 scale engine. Eddie Jongschaap had a Norton Villiers engine, chainsaws and a Perkins dragsaw powered by a BSA engine. Lloyd Tunbridge Lister “J” , Inter “pig” and a Roseberry engine. Harry Nolan a chainsaw collection and a oregon chain sign. John Booth a collection of chainsaws. The weather was good for the two days quite a bit of interest from the crowd all in all a good show, thanks all of you for the big effort in getting there. The 2 day event was a very good with pleasant sunny weather and 7 exhibitors. Rodney and Alison Springer’s display was 3 engines, a Lister “J” and a Rootyvandervoort and a 2HP New Record both were brought out of retirement a first run for about 6 years. Lutz Bockisch had a excellent display with his model Internal Combustion and Steam Engines . He kept the crowd on their toes with a blast from his whistles. Rex Wooberry’s display was his assorted garden tools, A Villiers engine driving an Ajax pump. I don’t know if he contributed to the excellent gardens. 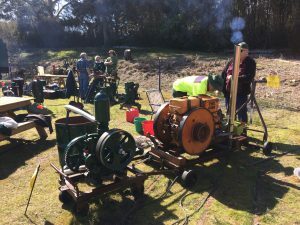 Lloyd Tunbridge had his 2 engines on display, an International “pig” an a 2HP roseberry both ran very well all weekend. Nigel Boyd had a very good display with his model train and railway items as well as assorted buildings. Harry Nolan had his “CS” Lister on display, it ran faultlessly all weekend, after all that would be expected from a Lister. Thanks to all exhibitors for making it a top weekend, well done. On the 11.11.2018 a small group of attended the celebrations at the PENGUIN HISTORY GROUP at Penguin. Members Joan and Kelvin Fielding, Deborah and Wayne Wood, Brian Ling and John Booth attended. Joan and Kelvin had a display of kitchen wares etc, Deborah and Wayne had a collection of hand tools all well named. Brian had a 1927 Cooper shearing machine and bullock yokes etc. John had a mid 1940s Ronaldson Tippett dragsaw also a single handed crosscut saw. A great effort by all attending. I would like to thank Karyn and Derrel Haines and their daughter Carmel (who works at UMINA), for coordinating our display as part of Seniors Week. Present were: Karyn & Derrel Haines, Lutz Bockish, John Booth, Judy & David Burk, Lloyde Tunbridge, Elaine & Viv Voss, Lyn Richards, Barb & Tom Moore and Brian Ling. Displays were: Derrel & Karyn David Brown 25 tractor , horse gear and some yo yos, Lyn assorted homewares and old cameras, Brian a scale jet engine, bullock yokes and cream separator, John assorted chainsaws, Tom & Barb Lister motor driving a waterpump which was running a man chopping a log also a ohv villiers powering another waterpump, Viv & Elaine the blowfly, Lloyde a International pig as well as a Roseberry motor, Lutz a collection of scale model hit and miss motors and David & Judy a Moffet Virtue running a compresser which ran a scale motor. Members Fred Harris and Tony Young called in for a look and talk. The residents were pleased and interested in our display. Can’t say enough about the hospitality (morning tea, flathead , chips and salad for lunch, and sausage rolls and party pies (Brian’s favourites) for afternoon tea). Just a terrific make you feel good , no drama social day with club mates doing our bit for a good cause. 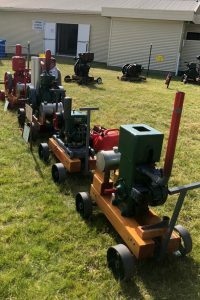 Thursday saw members, Rodger Duncan, Harry Nolan, Rodney & Alison Springer, Peter Unwin, Richard Edmunds & Halina Billing, John Booth, Lloyde Tunbridge, Lutz Bockish, Trevor Cowin, and David & Gloria Perry arrive at the Launceston Show Ground. A pleasant surprise was a nice sunny day and that Harry and Rodney had been there the day before to set up our fencing, thanks you two. Richard had his scale model Fowler crawler Sunbeam Tiger and Landdrover, John collection of chainsaws, Lutz collection of scale model motors, Trevor Big Chief Waterloo Boy 4.5 HP motor also a 3HP Ronaldson Tippett, and Lloyde “THE PARKING INSPECTOR” had a Roseberry 2 HP motor and a International Pig motor. We all had a great day, plenty of interest from the show patrons, happy show organisers ( we have been invited back next year). Thanks to all of you . Some of our members attended the Don River Railway Steam, Diesel and Machinery Gala Weekend October 6th and 7th. 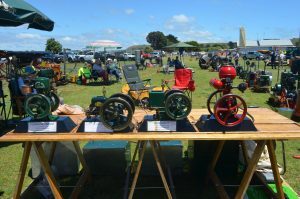 A group of members attended the 2018 Burnie Show. It was a great day and the weather fantastic. Burnie Show has a reputation of rain but this year it did not even look like raining. We had a great weekend with many members attending, including some from the south and north east of the state. There were 48 members present on Saturday and 44 on Sunday. As always the weekend was full of great camaraderie. Here are a couple of Youtube videos.